The major objective of this report is to analysis The Practices of Financial Management in Business Organization. General objectives of this reports are to get the basic knowledge about Financing in organization, to lots of information about organizational practices, Practical knowledge in financial management and to find the how total financial activities are going on in the organization. Finally this report make swot analysis The Practices of Financial Management in Business Organization. The role of a corporation’s management is to increase the value of the firm to its shareholders while observing applicable laws and responsibilities. Corporate finance deals with the strategic financial issues associated with achieving this goal, such as how the corporation should raise and manage its capital, what investments the firm should make, what portion of profits should be returned to shareholders in the form of dividends, and whether it makes sense to merge with or acquire another firm. A firm’s income is calculated by subtracting its expenses from its revenue. However, not all costs are considered expenses; accounting standards and tax laws prohibit the expensing of costs incurred in the production of inventory. 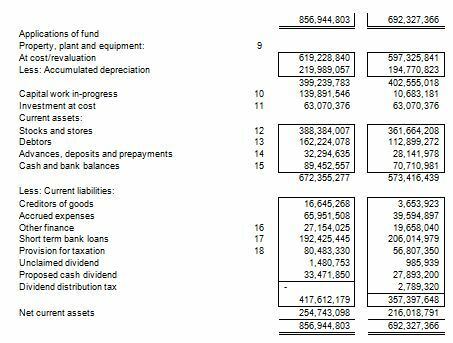 Rather, these costs must be allocated to inventory accounts and appear as assets on the balance sheet. Once the finished goods are drawn from inventory and sold, these costs are reported on the income statement as the cost of goods sold (COGS). If one wishes to know how much product the firm actually produced, the cost of goods produced in an accounting period is determined by adding the change in inventory to the COGS. A firm’s performance can be evaluated using various financial ratios. Ratios are used to measure leverage, margins, turnover rates, return on assets, return on equity, and liquidity. Additional insight can be gained by comparing ratios among firms in the industry. There are two sources of cash: reducing assets or increasing liabilities or equity. Similarly, a company uses cash either by increasing assets or decreasing liabilities or equity. A company’s sustainable growth rate is calculated by multiplying the ROE by the earnings retention rate. For this assignment I went to Dhaka stock exchange to buy the financial report. And also personally visit the Renata Ltd Head office to collect necessary information. Visit www.renata-ltd.com for other information. It helps me to get the basic knowledge about Financing in organization. As a student of Business Studies I get lots of information about organizational practices. Practical knowledge in financial management. It helps me to find the how total financial activities are going on in the organization. Manufacture and Marketing of Human Pharmaceuticals. 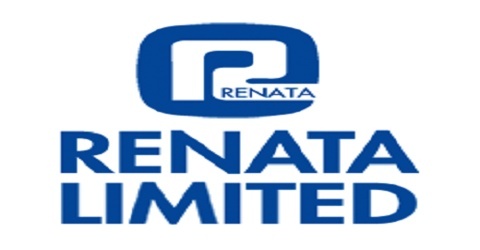 Renata 120,000 Square Feet (11,150 m2) Plant is located in Dhaka on 12 Acres of Land. This acquisition was made following a three-year relationship with HMR. From 1997-2000, Renata manufactured 19 Penicillin and Cephalosporin formulations on behalf of HMR. 100% Shareholding in Renata Agro Industries Limited (One of largest poultry breeding and hatching operation in Bangladesh). 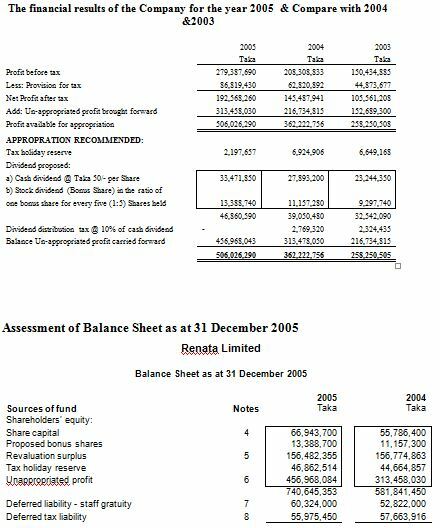 In my personal finding, collect the annual report of 2005 & searching website of Renata Ltd, the financial department of Renata Ltd doing all over the activities of Preparation of Balance Sheet Approach to Valuation, Measurement of Cash vs. Profits, Measurement of Cash Cycle, Calculating Revenue, Expenses, and Inventory, Assessment of Financial Ratios, Decision making Bank Loans, Find the Sources and Uses of Cash, Ensure Sustainable Growth, Measurement of Firm Value, Equity Value, and Debt Value, Assessment of organizational Capital Structure, Organizational Risk Management, Decision Making in Cash Flows to Debt and Equity etc. 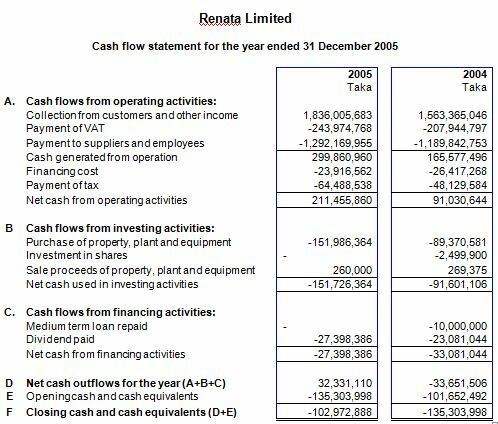 Renata ltd is a Public Limited (Dhaka Stock Exchange) company, So Financial Management play an important role in proper distribution for each share holder. Improving the infrastructure financial management. Need more publications & proper explanation. Improving the facility & trained professional. Improving productivity the training facility should be increasing. For costs minimize financial management suggest product bench marking & product value chain system. Need to be developing according to the global needs. Raw materials of the Reneta products are comparatively very high. So it needs new supplier. Financial department need to give attention in EPS. Decision making should be properly for new launch (Product & Technology). Accounting system should be full computerized. After going through all the financial analysis of the company I think the company is in a good position. Although some analyses are falling gradually yet if the company pays a little attention to the related matters which can improve, they will do much better in later. Finally, I would like to say that financial management is one of the core departments in the business organization point of view. A good business organization needs strong financial management department for achieving there mission & objective.